Need help with your genealogical research in Caroline, Dorchester, Kent, Queen Anne's or Talbot Counties? 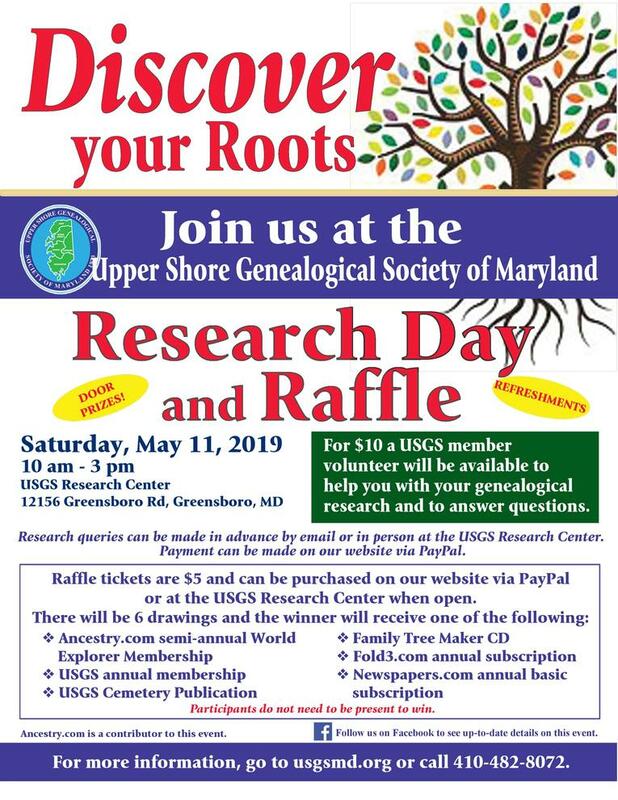 For $10.00 you can submit your genealogical research question by email or in person at the USGS Research Center. A USGS volunteer will answer your question and help you with your research for our Research Day Fundraiser on May 11, 2019. By Email: Please submit your query to usgsmd@yahoo.com and note "Research Day." You can submit your query in advance of the event. In Person: You can stop by the USGS Research Center when open. Please check the USGS Calendar. You do not have to be present to win. The 6 raffle drawings (one prize per drawing) will take place during the event on May 11, 2019. You can purchase a raffle ticket via PayPal or in person at the USGS Research Center when open. Please check the USGS Calendar. If you purchase your raffle ticket via PayPal, you will receive your ticket number via email and your name will be written on your ticket. Winners of the raffle drawings will be announced on our Facebook page and our website. Thank you to Ancestry.com for their generous donation and contributing to our event!